With constant winds surrounding the island, water sports such as kitesurfing, windsurfing and surfing are a popular pastime. Major championships such as the Kitesurf World Cup and the Chia Classic windsurfing competition are held here giving you some idea of how superb the conditions are. 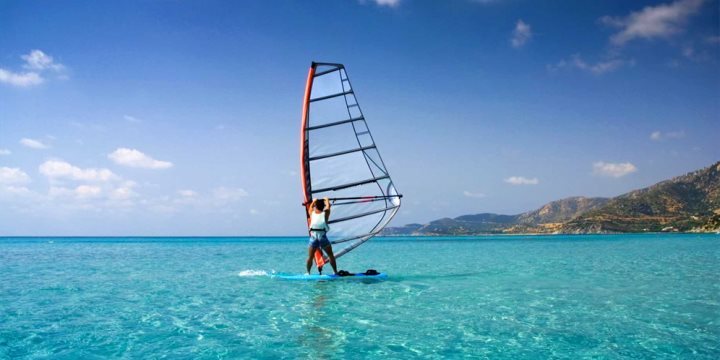 The main hive of windsurfing activity is in Porto Pollo, the windiest part of the island on the north east coast with fantastic views of the Maddalena islands. Whether you are an expert or a novice, there is plenty of space for everyone. Protected by the double bay, there are safe areas for beginners or if you have the experience (and audacity), you may choose to head out into the channel where waves peak at challenging heights. There are several good hire and tuition centres here that will cater for all your needs. Putzu Idu at San Giovanni di Sinis is another popular surfing beach offering a plethora of beach bars and windsurfing and kitesurfing outlets. This beautiful long sandy beach sits seventeen kilometres north of Tharros on the west coast. The coastline of Sardinia is littered with hotspots for surfing activities as well as places to hire equipment and instruction. If you’re after a more casual surfing experience avoiding the fierce waves of the west and opting for a bit of leisurely fun then head for Stintino, Spiaggia della Pelosa or Poetto beach.